The marketing co-op federation of Bihar, BISCOMAUN has emerged as the hero in the face of the looming urea crisis during paddy sowing season in the state. The co-operative organization is trying its best to supply urea at an unheard price of Rs 265 per bag to the farmers of the state. While the state govt led by Nitish Kumar is blissfully unware of the crisis as he has been convinced by his team of incompetent bureaucrats that there is enough urea in the state, the helpless farmers are forced to buy urea in the black-market whenever the supply in Biscomaun sale counters get exhausted or delayed. “Nitish only needs to go to a Biscomaun centre in the morning to gauge the situation; there are uncontrollable crowds which even local police finds tough to manage; even SDMs are seen managing the crowds at times”, said a few local reporters from the state to this correspondent. 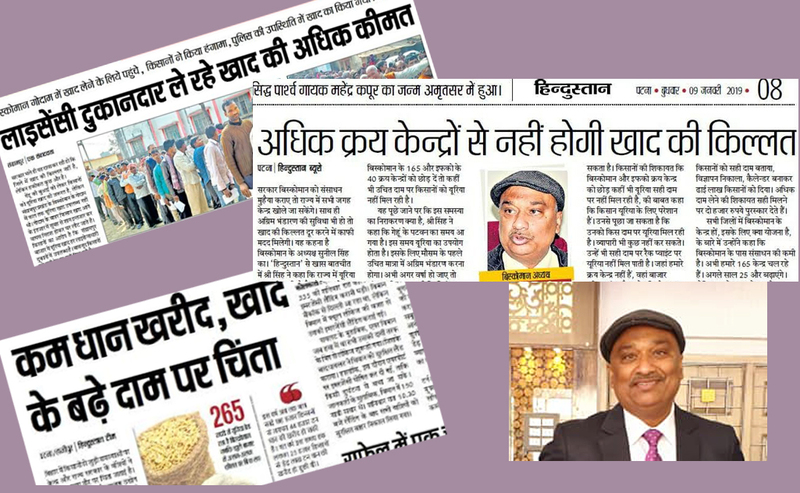 Driving home the point once again the superiority of the co-op model compared to governmental efforts, Biscomaun Chairman Sunil Kumar Singh- a sought-after person in the wake of the urea crisis by local reporters- says” Ye Sahakar hai Sarkar nahi” ( This is cooperative not a govt scheme). The looming crisis and Biscomaun efforts to tackle the situation have made Biscomaun and its Chairman famous overnight. As farmers gear up early morning to go to the Biscomaun sale counters, reporters of local dailies vie among themselves to interview its Chairman. His interviews have been carried by almost all the dailies including Hindustan, NBT and others. Having grown humble in the wake of a widespread appreciation, Sunil says to Indian Cooperative “I am enjoying the mental satisfaction of helping the farmers”. Imandari me bahut maja hai boss (There is a huge reward in being honest), he adds in chaste Hindi. The magic of Biscomaun has mostly to do with its unwavering price line of Rs 265 per bag. While urea is being sold in open market at the rate of Rs 400-500 per bag, Biscomaun has ensured that not an extra pai is taken by its staff-members. It has advertised phone numbers for lodging complaint in case of any breach in the price-line. Chairman himself monitors the phone lines as well as the supply-chain. Amidst all this, Sunil does not forget to thank IFFCO and its MD Dr U S Awasthi for supplying urea to Biscomaun. Though, himself a Kribhco Director he does not mind selling urea of the rival co-operative. “It is the question of standing by the farmers at any cost” Sunil tries to explain away the anomaly. Working with farmers of all categories including the Jeevika and small farmers in four districts, we have experience of shortage of fertilizer for years at particular time of crops. Sometimes appears to be a created hazards. Grey market enjoy this situation. Requirement of fertilizer is already known and can be easily estimated. It’s trend is gradually increasing, not a vertical move. There are Government department and efficient bureaucracy with the Government that can handle the situation for sake of development of the state. Reasons are not known why it couldn’t happen till now. Continuous media and print coverage of appreciated endeavors of BISCOMAUN is a great satisfaction for small farmers who cannot pay any extra money than quoted. Farmers prefer to stand in que for 10-12 hours than to buy at the cost of black market. They are showing faith and confidence in old and almost dead cooperative at one point of time, now become a vision- implementing organization. Sometimes, it becomes hard to believe that one person can make such a change. At one end, he works like a corporate when makes a vision-and plan for low cost delivery to farmers, on the other end he himself attend calls on the numbers advertised in the news paper to curb the corruption and to give prize of rs two thousand on every news of extra demand of money at Biscomaun centers, connect himself directly with farmers across the state. He is emerging an unannounced leaders of farmers in the state. It is by the believe and faith of farmers of the state for his relentless work for them.